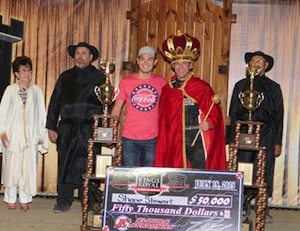 Shane Stewart captured the prestigious Kings Royal on Saturday night. Shane Stewart won the biggest race of his career as he claimed the iconic Kings Royal sprint car race at Eldora Speedway in Ohio. The winner’s check for $50,000 was pretty big, too. Donny Schatz dominated but ran out of fuel after leading 30 laps. Tim Shaffer started on the pole and led the first five laps, but blew an engine with Schatz right behind him. Schatz managed to avoid his slowing car, pass him and take the lead. Christopher Bell was chasing Schatz in the middle part of the race, but jumped the cushion in turn one, hit the outside retaining wall and flipped in between turns one and two. He was uninjured and is scheduled to compete in the 1-800-Car-Cash Mud Summer Classic NASCAR Camping World Truck Series race on July 22 at Eldora. It appeared Schatz was on his way to victory, but on the second-to-last restart with four laps to go, Stewart began to close on him and they battled side by side. They crossed paths with Stewart going high and Schatz going low and then suddenly Schatz’s car slowed. His car had run out of fuel and Stewart moved past him to take the lead. Schatz began falling back and then made contact with Brent Marks on the mainstretch, which put Marks out of the race and brought out the red flag and allowed everyone to refuel their cars. On the final restart Stewart pulled away for victory, while Jason Johnson, Abreu, Sammy Swindell and Daryn Pittman rounded out the top-five. Stewart started 14th and charged to first, while Abreu came from 10th and Swindell started 16th.